Through out my research about assessment I noticed that their is more to assessment than formal documentation, and anecdotal based off observations. Assessment can be done through many different facets and each lends its self to new insights about the students and their needs as a learner. In Early Reading Assessment:A Guiding tool for Instruction it is stressed that every student who comes into a class, comes in with different strengths and weaknesses. So formal reading assessments are done to determine what each student already knows and where they have gaps in their knowledge. Assessments like these allow teacher to be informed instructors. At Vancouver Island University we were taught how to use bench marks to assess students reading fluency, accuracy and comprehension; but their are more formal assessment tools that teachers can use when assessing their students. Some teachers find some tools more effective then others. Bellow are a few different prelearning assessment tool that can also be used. NOTE: Its important to fully understand tools and be trained in them, before using them with students and it is important to not solely rely on these tools to assess students abilities and what they have learned. Assesses phonological awareness, phonological memory, and rapid naming. Use in K-12 for student performance. Administered individually only. A set of standardized measures of early literacy development designed to monitor the development of prereading and early reading skills. Use in K-3. Administered individually only..
Assesses the reading areas of vocabulary, word analysis, and reading comprehension. Use in K-8. Administered individually or group. A theory that eight intelligences should be used to assess students’ strengths and weaknesses. In Alison’s Blog post How to assess Primary Students’ Work in Literacy Centers she shares some helpful tips on how to assess what learning is taking place in literacy centers. Her tips are both simple and provide informative feedback on how your student are doing. One idea is to pick two students each literacy block to check in on, since the teachers will be doing small group work this could be as simple as standing up and looking over at both students twice for about a minute each time, to see if they are on task and if possible what they are working on. Quickly jot down what they observe and return to small group work. At the end of the week she would go through the students written work that have been placed in their literacy folders. She makes some simple comments, maybe a tip to work on for next time, to show the students that the teacher is checking their work. While she is doing this she also records what she is noticing about their work on this grid. She puts check marks where students are meeting expectations, giving her an overview of what is going well and what needs attention with individuals and the class as a whole. If you would like to see what exactly she focuses on you can check out her blog and get a FREE recourse package on literacy center assessment. That being said some centers do not have written components so it may be hard for a teacher to see what students are doing in these centers, this is where the teacher can encourage the student to show case the learning they are proud of through the use of technological. Students can capture themselves; reading out loud, making new words with magnet letters, or showcase a puppet show they have created. The teacher can review these over time and use them when assessing the students learning. All of these observation can help build up a learners portfolio; they show how the student is interacting with materials and provide insight in how the student is doing and what areas the student can use more support in. This being said Alison cautions teachers to not to formally assess work done in literacy centers, for example in report cards, since the purpose of literacy centers is for student to practice literacy skills, not showcase their learning. Keeping student personally accountable for their work can be done in many ways. This can help students look at what they are doing critically. Both of the previously stated articles give suggestions on how to have the students assess how they are doing in their literacy centers. 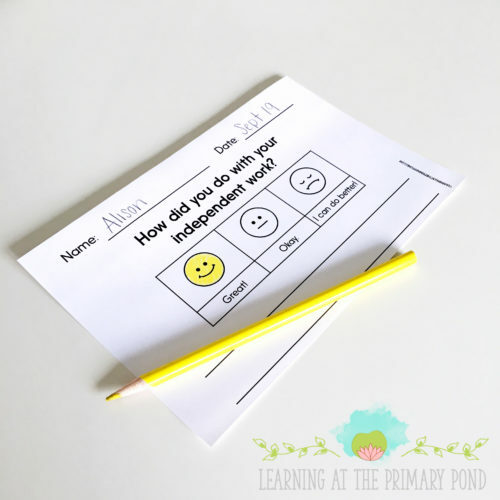 A simple way to check in with students and have them assess how they did in centers, is to have them fill out a simple happy face table. (shown bellow) And allow them to write on the lines below what they did well and a goal for next time. In conclusion it is important to continually assess students learning to provides informed instruction to the class as a whole and to individual students. Weekly assessment of the whole class can allow teachers to find where students are excelling and where they need more guided practice and support. Observing a few student in literacy centers each day allows for purposeful observation of all student (over time) and help teachers know if centers are accessible to all students. By providing simple feedback and instruction, students are held accountable for the work they are doing and give purpose to the work they are doing. Self assessment also allows students to create goals and think critically about how they are doing in their literacy centers. A balance of formal assessments, observation, self evaluations and evidences of learning create a functional and informative learning environment for literacy centers to take place. Since Literacy Centers are self directed, it is vital to the success of the students that each center is accessible to them. I read some articles and texts on differentiation in literacy centers and it has become clear what is essential in creating differentiated centers. “Differentiated Literacy Centers” by Margo Southall. While focusing in on differentiation I noticed many of the positives of literacy centers go hand in hand with differentiation if done right. Like stated in my first post, thoughtful consideration need to be taken when planning groups. Rotation group can be set up like Alison stated in her webinar but when making instructional groups it is important to group them in same skill groups. This allows for targeted instruction that will help the students build up their literacy skills and receive modified instructions for when they are in different literacy centers. These activities can have the same construct for the whole class but the supplies (worksheet, sight words, books etc) and sometime parts of the criteria may be different. The initial lessons will be done with the whole class, then they will do it in their small groups with teacher support with the specific literacy level changes and then once they are ready it can be put in the literacy centers. To go along with this, groups supplies can be codes by colour, number or (my favorite) images to allow students to know what activities are at the their level when going through the literacy centers. Another important thing it to have is the instructions and criteria, either at the centers or on anchor charts, with both images and words to help all students know what is expected during their literacy block. I want to stress, that in Leach writing she pointed out that this does not mean preparing hundreds of centers that get changed out every week for each level student, but instead it is important to have good quality activity that go along with many different books, sight word, etc. so that the activity its self may not change to often but the words and text do. Allowing the students literacy skills to go deeper into concepts. Over all in my research I learned that differentiation in literacy centers is not just having student book bins with leveled books for each student. It is a comprehensive process that addresses multiple different literacy skills to create students who are proficient in all areas of literacy. Concepts are introduced through activity that allow students to explore each area of literacy with the class, in their small groups and as an individual. By differentiating materials in the small groups students can feel confident in their tasks and are able to explore concepts deeper. Most importantly to do any of this, assessment of the students must be done and each students needs must be identified. This area is so important my next post will be dedicated to looking deeper into how to assessment with relation to literacy centers. Unlike my last post about literacy centers; instead of seven centers their are five centers. Daily 5 is a very popular right now and their are many different ways to go about using daily 5. Three ways I have heard or seen it being done are; to have the class go through the stations together, to separate them into groups like my first post, or to allow the students to have choice (allowing them to pick which daily five they do each day). The set up is similar with literacy centers, where there is a mini lesson before rotations begin. For beginning teachers Daily 5 is great because it gives set lessons; to start off your teaching it give you anchor charts and organizational tips. It also talk about the amount of time each idea take, the importance of the five areas and how to introduce daily five over time. The ideas in the text sets the students up successful in each of the centers. It scaffolds the learning and allows teachers to experiment with the idea, so they can find what works best for them. One big thing it stresses is to introducing 1 of the daily 5 area’s at a time, allowing students to gain fluency and stamina for each area. The book also talks about classroom set up and how to organize your classroom to allow for learning. Like the centers in the last post, their are some similarities, which reinforces their importance. In my practicum class right now we are doing daily five and I can see how these centers allow the students to be independent and allow for the teacher to really work with children individually and in small groups. In our class, so far, our teacher has only introduces the first three areas above. I am excited to see how my mentor teacher introduces the other two areas of the Daily 5 to the class. Anchor charts are the bases of many of these lessons, which are helpful for the students to become successful. I would like to stress that Daily 5 should not be the only literacy that the class does, in my class we still do writers workshop once or twice a week and even in the literacy centers from my last post the teacher had another time of the day for more writing activity’s as a class. These centers allow for more exploration.These areas allow for the practice new skills, creation of new ideas and manipulation of words. Daily Cafe is one thing that can go along with Daily 5 to enhance the students learning much like writers workshop. Here is a link to the Daily CAFE website with more Daily 5 ideas along with Math Daily 3 and Classroom Design.